Guava is a tropical fruit and is seldom mentioned when we talk about nutrition. But, this fruit could well be a superfood for breast cancer, thanks to its rich anti-cancer nutrient. Guava fruits may be round, ovoid or pear-shaped. The better varieties are soft when ripe, some crunchy in texture with edible rind and seeds. The varieties may come in white, pink, yellow and even red. Its small seeds range between 100 and 500 per fruit. Guava has an incredibly high content of vitamin C. In fact, one guava fruit contains four times more vitamin C than an average-sized orange; and ten times more vitamin A than a lemon! 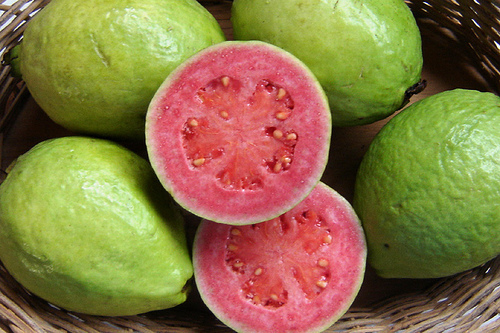 Guava is an excellent source of fiber, almost 70 times more fiber than can be found in an orange! Other key nutrients are vitamins B2 and E, calcium, magnesium, potassium, copper, folate, iron, manganese, phosphorus and potassium. The high content of vitamin C (ascorbic acid) in guava makes it a powerhouse in combating free radicals and oxidation—key enemies that cause many degenerative diseases. Anemia: Guava is an incredible fruit for individuals who have anemia that could be caused by a deficiency in vitamin C. It helps facilitate the body’s absorption of iron to treat their anemia more effectively. Anti-cancer: The antioxidant virtue in guavas are believed to help reduce the risk of cancers of the stomach, esophagus, larynx, oral cavity and pancreas. The pink variety is rich in lycopene in amounts twice as much as tomatoes! Lycopene is an excellent antioxidant that fights and reduces the risk of breast cancer. Bone health: Guava is rich in the right amount of sodium, magnesium, calcium and phosphorus that are needed for building strong, healthy bones. Cholesterol: The vitamin C in guava makes absorption of vitamin E much more effective in reducing the oxidation of the LDL cholesterol and increasing the (good) HDL cholesterol. Digestive health: The fiber in guavas promote digestion and ease bowel movements. A study shows that guava can be used to treat diarrhea, fight harmful gut microbes and prevent digestive infections, thanks to its antimicrobial and antispasmodic properties. Eating plant foods high in insoluble fiber is also beneficial in preventing and treating diverticulitis. Eye health: High antioxidant activities and carotenoid boost vision and eye health. When eating foods rich in antioxidants on a regular basis, you can slow down or prevent the development of cataracts and macular degeneration. Heart disease: Eating guava or drinking guava juice regularly helps keep heart disease at bay. The rich source of dietary fiber and potassium in this fruit helps to lower bad cholesterol. Immune system: High content of vitamin C protects your body’s cells from damage and help boost immunity and fight disease-causing pathogens. If you’re fighting a cold, drink guava juice, instead of orange juice. And I mean freshly-extracted guava juice, not from the box! Skin health: As with most fruits that are high in antioxidants content, guava protects your skin from damage and delay premature aging. Vitamins A and C enhances skin health, elasticity and firmness. If you don’t like to chew hard fruits like me, choose guavas that are fully ripe so that it is softer and easier to chew. It makes good healthy snacks if you cut into bite size and dip into prune powder. You may need to eat many pounds of guava before you really see its healthful effects. So, the best way to take advantage of all the wonders in guavas is to juice them and drink them regularly. To juice guavas, choose the softer variety or use the riper ones. Cut them into smaller pieces than you would normally cut other fruits and juice. Most people juice the pink guavas as they are generally juicier and easy on the juicer. Enjoy!